I am clearly obsessed with tomatoes these days. This recipe is easy to make, pretty healthy and super tasty. 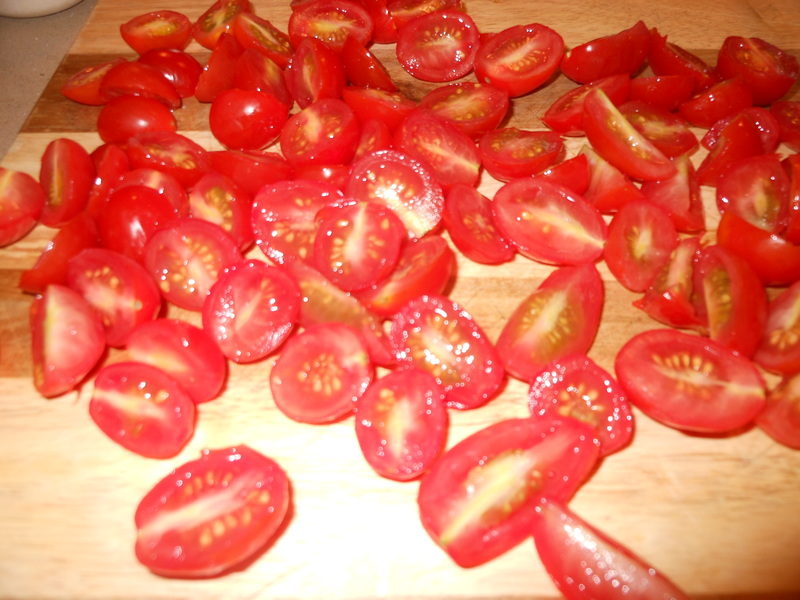 I just love those little grape tomatoes and have been using them a lot lately in everything I cook. Of course, the spinach is an issue because of Joel, but he’ll just have to pick it out. He really doesn’t know what he is missing. 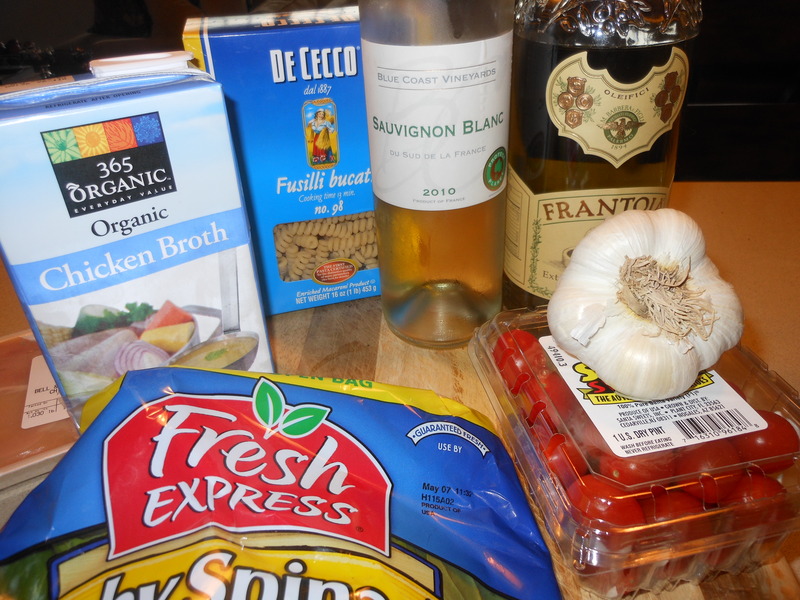 Most of the ingredients you’ll have on hand. If you’re really trying to keep it lighter, omit the butter and increase the olive oil by one tablespoon. Just cook the chicken in the olive oil without the butter. It will be fine. Cut the chicken into small or large chunks (whatever you would prefer)just be sure they are all pretty much the same size to make cooking time is the same , put in a single layer and allow the chicken to brown up nicely (when you first put it into the skillet try not to touch it ), about 3 minutes on each side depending on the size of the chicken chunks. Enjoy this delicious meal–it’s perfect for a nice lunch, dinner, or brunch dish. Prep time is quick , about 1/2 hour. This is really a beautiful light meal . *I cut this recipe in 1/2 this evening for just the 2 of us. This dish should feed 5 – 6 people nicely as is. 1 pound small pasta ( penne, rigatoni, I used Fusilli Bucati ) I like a small macaroni as opposed to spaghetti in this recipe. 4 whole boneless , skinless Chicken Breasts ( adjust to how many people you’re serving) app. 2 lbs. Cook pasta according to directions . Drain and set aside. I try to keep a little of the pasta water in the event I may need it at the end of cooking, just take a measuring cup and scoop out a cup of water and set aside, if you don’t use it you haven’t lost anything. Sometimes towards the end I add it to finished pasta to add a little liquid to the pasta, especially if you cook in advance. I didn’t need it tonite because we ate it as soon as it was cooked, and it was just right . Cut chicken breasts into chunks and sprinkle with kosher salt and freshly ground black pepper ( (I prefer small chunks) Be fairly generous with Salt and Pepper. Heat butter and olive oil over medium high heat in a large skillet. Add chicken in a single layer and don’t touch for a few minutes and let it brown up, turn over once it starts to brown and form a coating. When chicken is done, remove chicken from skillet. I prefer smaller chunks, do whatever you like, just keep them uniform for even cooking. Turn heat down to low, add garlic and give it a quick stir, be careful not to burn garlic. Pour in wine and broth, stirring to deglaze the pan, raise the heat and allow the liquid to come to a boil. Allow the liquid to boil for a bit, I let it boil for about 5 minutes, reduce the cooking liquid by at least half. I then reduce to a simmer and add the tomatoes, I let them cook for about 5 minutes till they start to release their liquid a bit, and just start to soften. I also add Salt and Pepper again here, then I add chicken to pan . stir it around, add the bag of spinach it will start to wilt as you toss everything , then add the drained pasta, mix well and serve. So light and delicious. Sprinkle Grated Parmesan or Parmesan shavings are good as well. 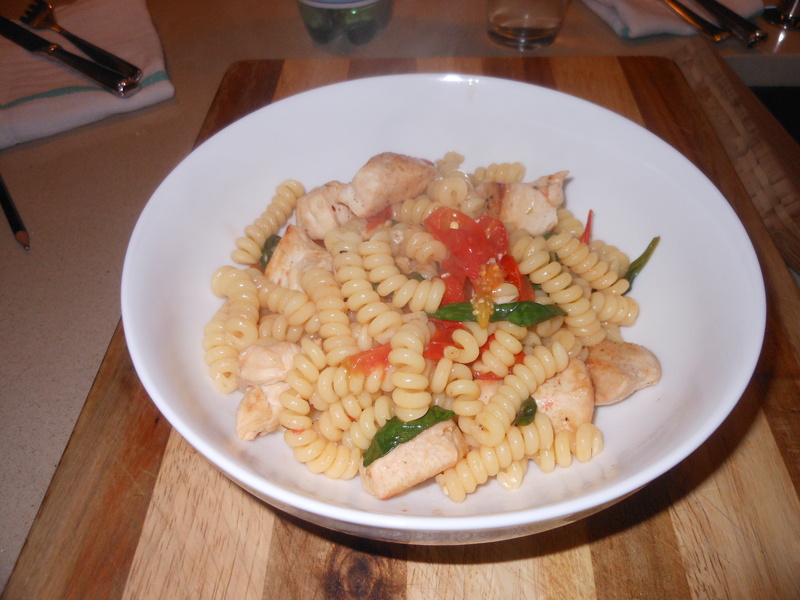 This entry was posted in chicken, Healthy Cooking with Candi, pasta and tagged Chicken, Chicken and Spinach, Fresh Tomatoes and Pasta with Chicken, More Pasta with Fresh tomatoes, Pasta with Tomatoes, Spinach and Pasta, Tomatoes. Bookmark the permalink. 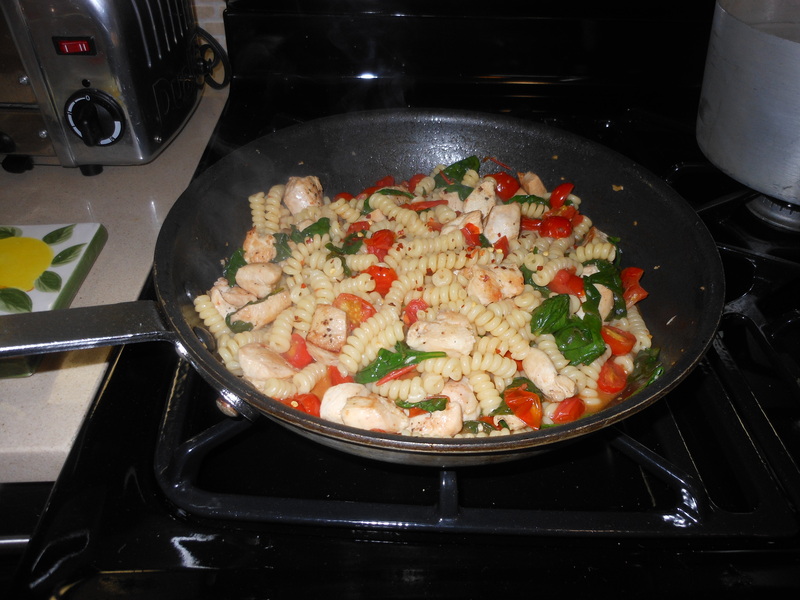 made this again for dinner last night, used fresh tomatoes from Farmer’s Market, didn’t make a bit of difference. This is a light, delightful very yummy meal. Very easy to prepare, just make sure you brown up the chicken with enough salt and pepper first. Enjoy.